A simple dessert now frequents in many of the blogs I'm following is this mighty little bourbon biscuit milkshake. My first thought was" biscuit in a milkshake ?!" since am not at all a fan of cookies n biscuits and so not liked the idea of mixing it in my fav. milkshake. But then, as a blogger, I wanted to give a try. To tell u the truth, a small pack of bourbon biscuit was lying in my kitchen counter for almost 2 months .Din't have the heart to throw out either. 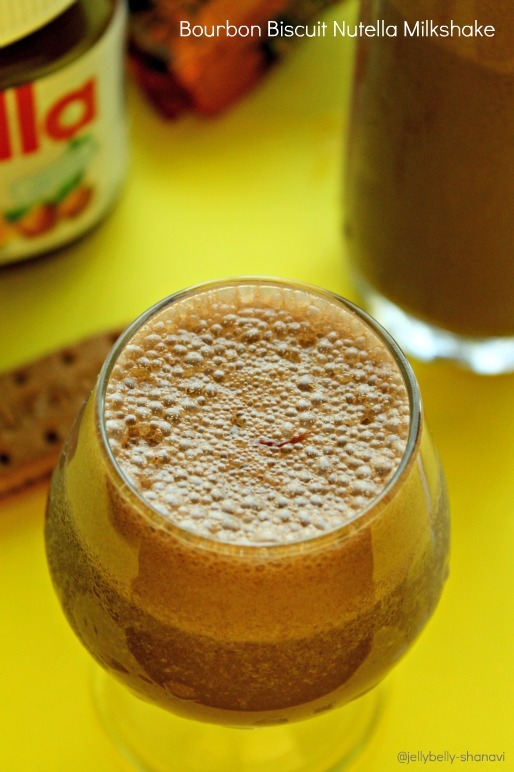 Suddenly, I remembered seeing a drink made with this biscuit a while ago from Sharmis page and ofcourse altered acc to my taste.It was so YUM ,u wouldn't believe ther's biscuit added in ur shake. Just loved it to the core..I recommend everyone to try this shake n get to know how tasty it is.. Bourbon biscuit -- 3 nos. Break the biscuits into mini bites and add in the mixie jar. Now add 1/4 cup of chilled milk,Nutella,coffee powder and sugar(if adding) followed by biscuits. Blend this mixture well for 1 minute / until they blend together and resembles a chocolaty sauce. Now pour in the remaining milk and the ice cream and give it a good whip. Pour in the tall glass and decorate with ur favorites and serve cold. Otherwise,serve as such like I did. 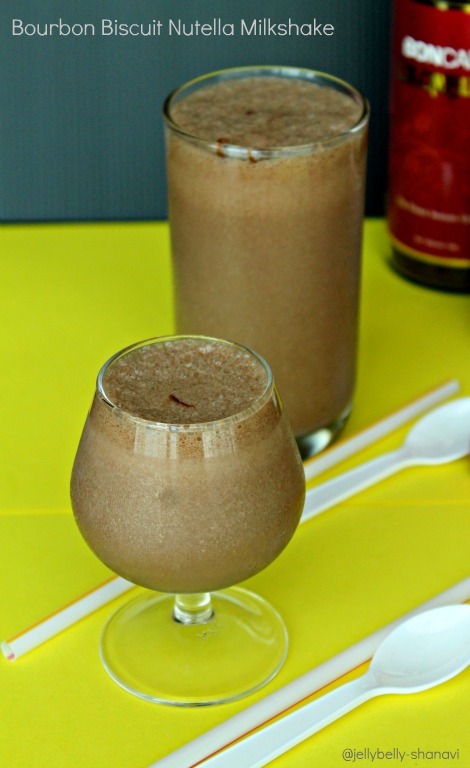 I've added chocolate ice cream and since it's an all chocolaty delight,perfect for a simple dessert after ur big meal. U r welcome add vanilla ice cream. U may also add half &half / fresh cream in place of milk but in small quantity for richness. Columbian coffee gives a great fresh taste n aroma and so I borrowed some from my H's counter. Wow love the idea of adding nutella , looks yum! What an amazing combinations...Must have tasted heavenly! such a fun idea that is. kids would love this. love the addition of nutella. 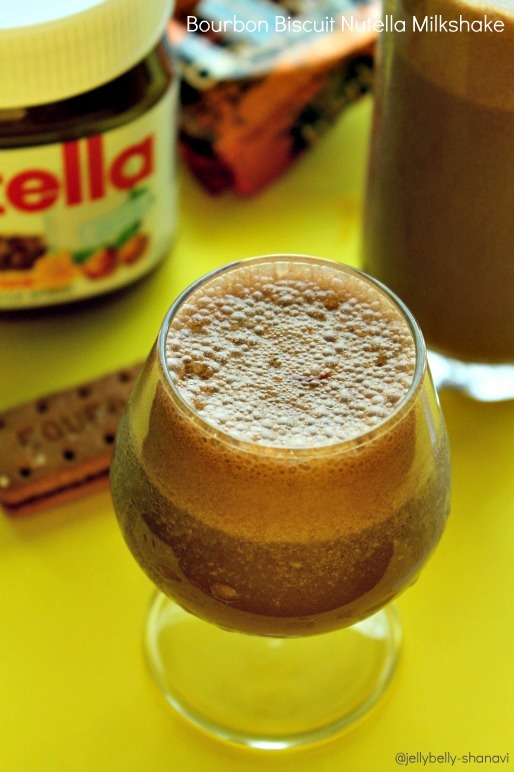 Superb drink...Loved the idea of bourbon biscuit and nutella..
Oh god, breathtaking pictures Shobana, cant take my eyes from ur shake,irresistible and looks absolutely divine. Yummu yet tasty shake,love it.